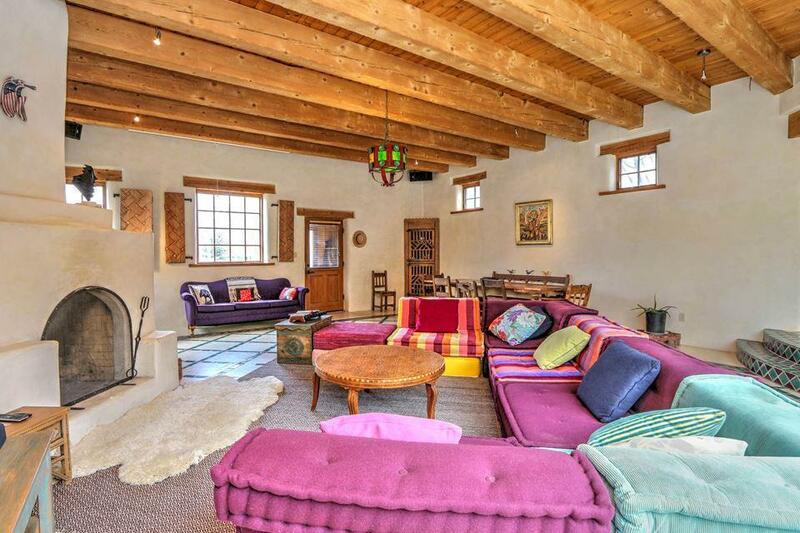 You might think this perfect pied--terre on historic La Loma Plaza provides a window into the past, but in fact it was custom-designed and constructed in 2008, seamlessly integrating the best details of traditional Northern New Mexico construction with all the contemporary comforts that make for carefree living. The setting contributes to the wonderful old feel; La Loma Plaza was once fortified and is now on the National Register of Historic Places. The home is next to San Antonio Church, which was blessed in October 1876 by Archbishop Lamy but today is seldom used. The rooms are large and light, with accordion glass doors in both the great room and the bedroom and large sliding doors in the kitchen, all of which open hacienda-style onto a spectacular private patio with a fountain. La Loma Plaza is a quiet residential neighborhood, and privacy is a hallmark of this extraordinary home. Another striking feature is the size of the living spaces. The great room is complemented by an equally "great" bedroom, and the kitchen comfortably accommodates a dining table and chairs. Handcarved antique doors, radiant floor heat, hard-trowel plaster, ceramic and limestone tile floors, hand-adzed beamed and T&G ceilings, and handcarved shutters can be found throughout the home. The fireplace in the great room has a surround that is sculptural in quality, and 14' ceilings soar overhead. (Don't miss the plexiglass tile in the floor that allows you to appreciate a touch of area history.) 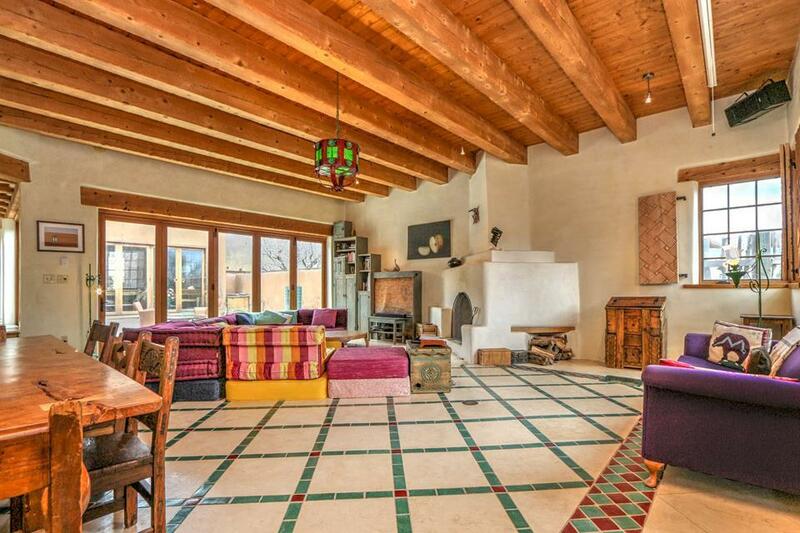 Follow the handmade tile path to the bedroom, which features a walk-in closet that replicates in miniature a chapel, a corner kiva fireplace, 12' ceilings, and a view of Truchas Peak. The tiles in the full bathroom are entirely handmade. The walk-in shower doubles as a steam room, or you may choose to soak in the clawfoot tub. From the roof, you can enjoy 360-degree views, a rarity in town. 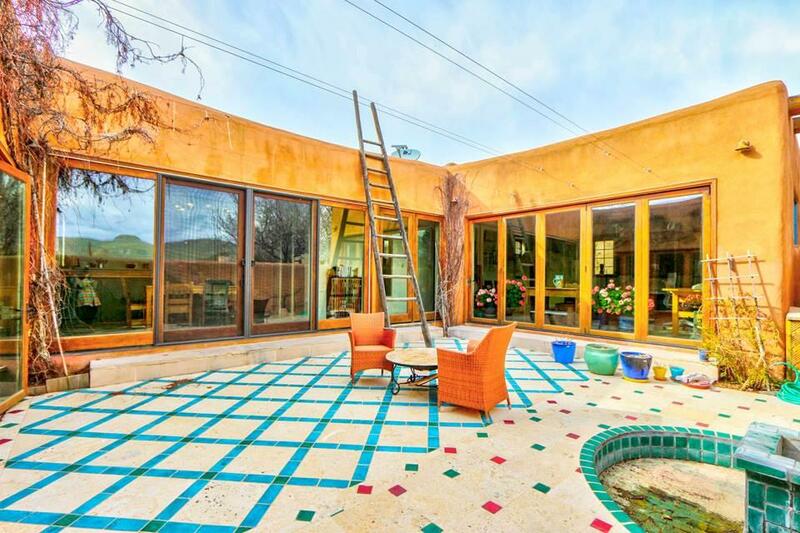 This beautiful, unusual home is a flawless jewel box in an ideal location. 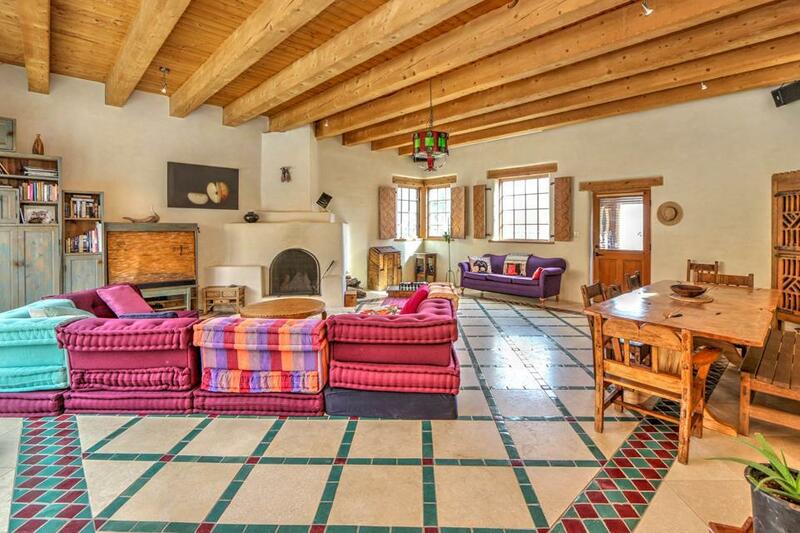 Walk to the cultural center of Taos--Taos Plaza--and take advantage of dining, shopping, galleries, museums, live entertainment, and the farmers' market, all appealing factors to residents and guests alike. Come home, cook up a feast, and entertain your houseguests, or take advantage of the privacy and quiet to indulge your creative impulses. One size fits all!